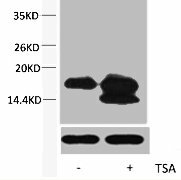 Western blot analysis of extracts from Hela cells, untreated (-) or treated, 1:5000 Histone H4K5ac (Acetyl H4K5) Polyclonal Antibody. Western blot analysis of extracts from Hela cells, untreated (-) or treated, 1:5000 using the Histone H4K12ac (Acetyl H4K12) Polyclonal Antibody. 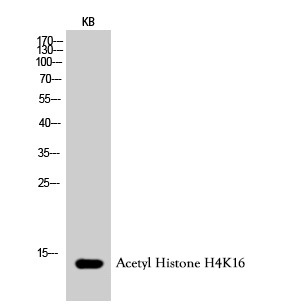 Western Blot analysis of KB cells using Histone H4K16ac (Acetyl H4K16) Polyclonal Antibody using the Histone H4K16ac (Acetyl H4K16) Polyclonal Antibody. 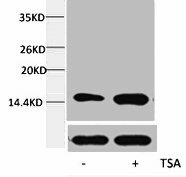 Western Blot analysis of KB cells using Histone H4K8ac (Acetyl H4K8) Polyclonal Antibody.